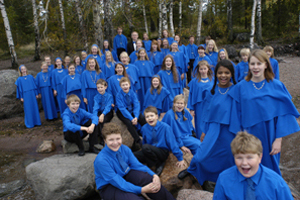 The Tapiola Choir is one of the world's leading children's choirs and consists of 70 young musicians aged 9 to 18, all of whom also play at least one musical instrument in addition to singing. Erkki Pohjola founded the Tapiola Choir in Espoo in 1963. After meeting Zoltan Kodály and Carl Orff in 1964, he adapted their ideas into a free-form education method with a chamber-music approach, building on the innate creativity and musical talents of children. He continued to pursue this new music education ideal as conductor of the Tapiola Choir for over three decades. During that time, the Choir evolved from a run-of-the-mill school choir into one of the most acclaimed vocal instruments of our time. International critics called its unique sound the ‘Tapiola Sound'. Kari Ala-Pöllänen continued the work of Erkki Pohjola from 1994 to 2008, until he was succeeded by Pasi Hyökki, one of the Choir's own alumni. Since winning the Silver Rose Bowl at the prestigious ‘Let the Peoples Sing' competition organized by the BBC in 1971, the Choir has undertaken more than 60 international tours, three of them circumnavigating the globe. In 1996, the Tapiola Choir became the first recipient in the field of music of the UNESCO Prize for the Promotion of the Performing Arts. The Tapiola Choir has a highly diverse repertoire, ranging from the classical repertoire to contemporary music, from folk music to jazz. Numerous Finnish and foreign composers have written new works for the ensemble, often with the Choir being actively involved in the composition process. The Tapiola Choir has made numerous recordings mostly for the Ondine label.